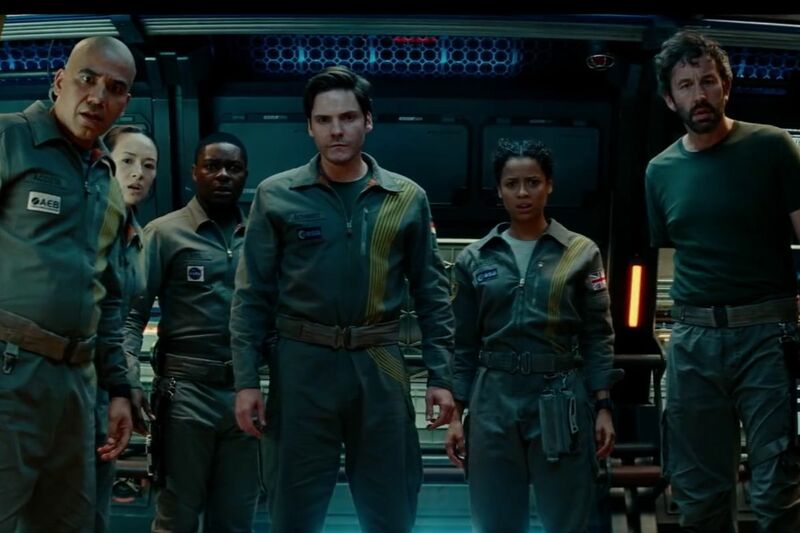 Aboard the orbiting Cloverfield space station, a seven person team is about to activate The Shepard Accelerator, a device intended to draw a supply of free energy from another universe. The device is successfully activated but something goes wrong and the crew come around to find that the Earth has vanished. Bizarre things then begin to happen – the cage of experimental worms appears in Volkov’s stomach; Mina, a woman none of them have ever seen before, materialises inside a wall; Mundy’s arm becomes stuck inside the wall and has vanished when they pull him out, it later reappearing with a will of its own. Gradually they realise that the experiment has transported them into an alternate timeline and has caused the two different realities to merge. The Cloverfield Paradox was the third of the Cloverfield films. The series began with the Found Footage monster movie Cloverfield (2008) and was followed a few years later by 10 Cloverfield Lane (2016), which was set in an underground bunker as some unknown event may have happened outside. All three films were produced by J.J. Abrams, while both sequels are executive produced by Matt Reeves and Drew Goddard, respectively the director and writer of the first film. One of the distinctive facets of the Cloverfield films is that all three were made in secrecy and almost nothing told about them until right up to the release, while the trailers that went out were cryptic at best in the clues they gave an audience about the films. In the case of Cloverfield, the title of the film was not even announced until only a few months before release and all we saw was a trailer with the head of the Statue of Liberty bouncing through the streets. 10 Cloverfield Lane was shot under a false title and the world knew nothing about it until the trailer went out two months before the film’s release. In the case of The Cloverfield Paradox, the film was shot under the title The God Particle and nobody knew that it was a Cloverfield film until an ad was released during the 2018 Superbowl along with the announcement that the film was premiering on Netflix immediately after. This incidentally makes The Cloverfield Paradox the first of the Cloverfield films to not premiere theatrically – the reasons for this, one suspects, is that it was not regarded as being very good (it immediately attracted a host of bad reviews as soon as audiences saw it). Abrams and Bad Robot have announced further Cloverfield films and stated that these will have theatrical releases. The other oddity about the Cloverfield films is that there is not much connecting them together – usually just common fictional brand names in the background of scenes. The Cloverfield Paradox does make somewhat more of an attempt to tie the two previous films together. The bunker that Roger Davies hides in with Clover Nee in the latter scenes would appear to be a replica of John Goodman’s one from 10 Cloverfield Lane. There are also shadowy shapes of leviathans seen striding through the city with one finally emerging through the clouds in the last shot, which you assume might be the same monsters we had in Cloverfield. I usually try to approach films with a blank slate, knowing nothing more about them than maybe a glance at the credits and plot synopsis and a viewing of the trailer. Reviewing The Cloverfield Paradox required having to tune out the amount of social media hot air that had been devoted to slagging the film immediately after its premiere. As such, it emerges as not a particularly bad film – the people calling it such either haven’t seen enough bad films (I’ll happily recommend some of the ones I have to watch) or else are engaging in the degree of hyperbole that is required to gain attention on social media. On the other hand, I didn’t think it was a particularly good film either. The Cloverfield Paradox feels like it is a film that has some okay ideas at its core – an experiment to get free energy creates a rift between two parallel timelines ends up with characters from one merging into the other. (Indeed, this same premise was used some months before in Kill Switch (2017), a modestly-made Dutch sf film). On the other hand, director Julius Onah never seems much interested in the alternate timeline aspect. The confusions and quandaries over people appearing in a different timeline are presented as though Onah imagined this was the first film to ever think of them. Newsflash, it isn’t – you need look no further than some of J.J. Abrams’ other tv shows such as Fringe (2008-13) and 11.22.63 (2016) or for that matter Star Trek (2009). Similarly, you get the impression that the filmmakers were inspired by recent real space films such as Gravity (2013) and Life (2017) and for these reasons decided to set everything on board a space station. (There is no real reason why the entire film could not have been set on an earth-based laboratory, for instance). However, if you are going to follow in the footsteps of these films, you have to do the space thing right. The film has sections of its space station rotating, which would certainly provide a functional semblance of gravity, however this merely becomes the opportunity for them to ignore gravity thereafter and have the crew walking around in regular rooms. In reality what you would have is something like the vast rotating cylinder in 2001: A Space Odyssey (1968) and the centre of the sphere where there would be no gravity. There are numerous instances of absurd science – like the scene where Zhang Ziyi is trapped in a flooding airlock as the outer door ruptures causing the water in the airlock to freeze in about one second flat. Or during the scenes where one of the rotating wheels has come loose and the astronauts have to venture out to fix things amid a field of furiously spinning debris – in actuality, as soon as something is no longer attached to a rotating station, it would simply float away propelled by the force the spin had given it. Moreover, Julius Onah seems far more interested in creating a horror film than a work of science-fiction. The one thing that seems to drive the show is a series of bizarre effects every few minutes – Elizabeth Debicki being found inside wall with wiring materialised through her body; Askel Hennie vomiting up the missing worms and later found with a large metallic ball inside his stomach; Chris O’Dowd’s arm disappearing inside the wall and the others pulling him out to find the arm completely missing – although it turns up later where it rather ridiculously seems possessed of its own lifeforce and able to write messages; and the aforementioned scene with Zhang Ziyi drowning and then being frozen in an airlock.